From The New York Times article, "Emancipating History," by Edward Rothstein -- CHARLESTON, S.C. — Here, in this lovely town, once one of the most prosperous in the American colonies, there is no escape. Of course, in the North slavery can seem like a distant abstraction, creating its own problems. But in Charleston all abstractions are gone. The strange thing is how long it has taken to see the substance, and how much more is yet to be shown. Several directors of the region’s historical plantations and homes, which offer tours of these once-prosperous estates, told me that until the 1990s, slavery’s role was generally met with silence. Then, in 1991, a wood-frame house in which freed slaves had lived from the 1870s was restored as Eliza’s House, to show the living quarters that served generations of workers. In 2005 half of Eliza’s House was used to mount an exhibition still on display that tells the history of slavery and free black labor on the plantation, complete with the names and cost of each slave — some 2,600 people in all. Historians of slavery must track census data and demographic information, commercial records and archaeological finds. There are few surviving objects or dwellings, and aside from important oral histories, there is scant documentation from slaves themselves. At the beginning of the 20th century, in fact, the field was dominated by Southern historians who gave the institution of slavery a paternalistic veneer. It was only in the 1930s that the historian Frederic Bancroft began piecing together the evidence showing just how important the domestic slave trade was. And that meant, to put it mildly, that slave families and owner loyalties were far less secure than previously portrayed. 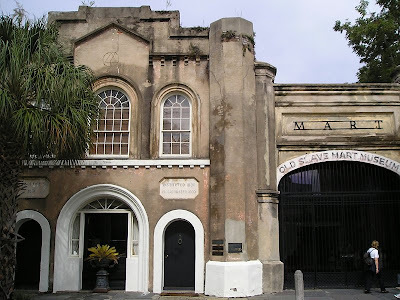 The history has evolved since then, but it is still fitting that one of the most informative sites about slavery in Charleston is, despite its modest size and resources, a museum that focuses specifically on the slave trade and is housed in a building that during slavery’s last established years was one of the South’s primary slave markets: The Old Slave Mart Museum. Under the direction of Nichole Green, and with Elaine Nichols as curator, the museum, owned by the City of Charleston, is not a repository for objects, but a place where a narrative history is adroitly and soberly told, mostly on mounted wall panels. Part of that history is reflected in the building itself. The trans-Atlantic slave trade had been forbidden by Congress in 1807, but that meant that the domestic trade became all the more important. Between 1789 and 1865, we learn, more than a million American-born slaves were sold in the South. In Charleston, they were mainly sold outdoors, near the Old Exchange Building . But eventually there were complaints about crowds obstructing traffic, and, more important, perhaps, as tensions with the North increased, sales of human beings were attracting critical attention. The city banned outdoor slave sales near the Exchange after July 1, 1856. That was the very day that “Ryan’s Mart” opened indoors, becoming the most important showroom in Charleston.